We believe that all Scripture is God breathed (2 Timothy 3:16), which makes the Bible the single most important book ever written. It is an eyewitness account of historical events of such magnitude that those events significantly shape every aspect of the world in which we live. We believe that the Church is responsible to know God’s Word and to use the Bible as a guide to achieving His purposes—evangelism, discipleship, baptism, and teaching obedience to Jesus’ commands (Matthew 28:16-20). It’s our desire is to help the church obey the Great Commission by enabling all people to engage with the text in a way that speaks to their hearts. We believe that the Bible is God’s Word to each and every one of us. Therefore, everyone should be able to understand what God is saying to them. 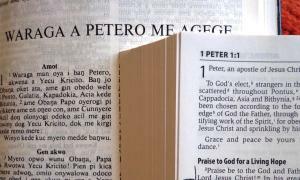 What this necessarily means is that God’s people need access to the Bible printed in their own language. More than 40 different languages are spoken in Uganda and more than 68 different languages are spoken in Kenya. Imagine opening the most important book ever written and finding over 1,000 pages written in Karamajong. How helpful would God’s word be to you in that form? When people finally receive God’s Word in their own language, lives are changed. Individuals, communities, and whole countries can be transformed as people are led to Jesus Christ and to a right relationship with God. Take a look at what we’ve done with your Bible gifts in the past and consider giving the gift of God’s Word written in the local languages. Click on the link to the right and give $15 for each local language Bible you want to sponsor.